The day before Yankee Dental Congress was scheduled to open in Boston, the city was suddenly covered by a blanket of nearly three feet of snow, bringing everything to a standstill. As they watched the storm approach, the event organizers faced an emergency situation. Would the show be able to open? Freeman is no stranger to planning events in the Northeast. We assume bad weather will happen, and we plan for it. All of our winter events in New England incorporate accelerated timetables, with any freight under our control moving in at least one day early. The weekend before Yankee Dental Congress, early weather reports didn’t look good. But we were on top of the forecasts and prepared to act quickly. The immediate goal was two-fold: to move in as many exhibitors as possible before the storm hit, and to project a sense of confidence and decisiveness for exhibitors and attendees so they could feel confident in the event plans and reinforce their commitment to attend. Our obsessive communication, as well as professionalism, purpose, and planning broadcast confidence that the event was on track and moving forward, instilling confidence in everyone involved. Originally, only a few exhibitors were scheduled to move in early on Monday. However, because Freeman had planned ahead and moved in gear early, we were able to make the show floor ready for exhibitors ahead of schedule. Our staff worked closely with the event management team to spread the word that the venue would be ready on Monday for everyone who could come early, from union employees to exhibitors. To ensure exhibits were able to arrive, Freeman let freight companies know that Tuesday deliveries could be made Monday, before the roads became impassable. Sure enough, by Monday morning nearly 60 trailers were in the bays, and a solid staff of laborers was working hard. The entire team spent an exhausting day getting as many exhibitors as possible set up on the show floor. On Tuesday, the blizzard slammed the city as predicted. Although Boston was under a travel ban, many individual union workers who lived within walking distance made their way to the convention center to help with any remaining incidental needs. We had also already booked hotel rooms for key people who needed to stay overnight due to the weather. 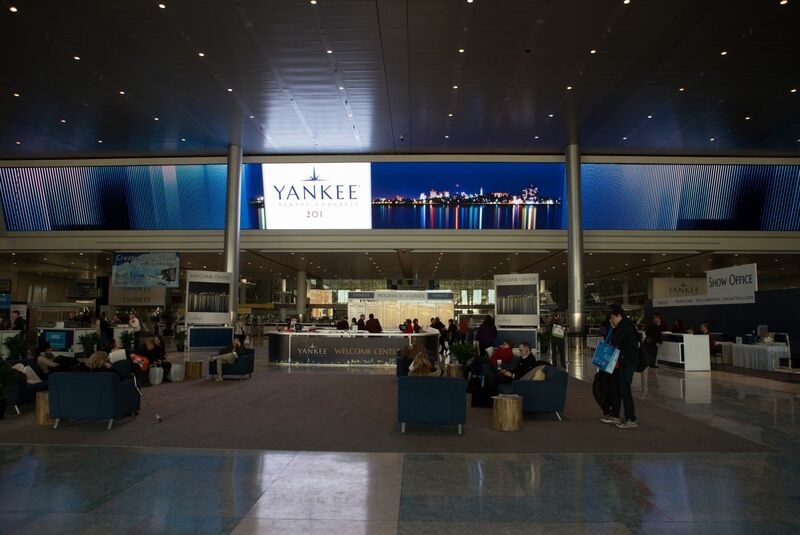 By Wednesday the storm had passed, and Yankee Dental Congress opened! Only 11 of 458 exhibitors cancelled, with almost no change in attendance. The local nature of the event meant flight cancellations had a minimal impact on attendance. And our urgent, proactive approach ensured the exhibit hall was ready for the attendees — the client was thrilled. It really goes to show how everyone can come together. This points to yet another example of our resilient Freeman team and their dedication to making sure we are ready for anything.